There is as usual a lot to cover this week so here goes and I will try to be a little less wordy than of late! The first thing is to decide who gets top billing and it does not go to the Men’s 1sts although they provided us with a lot of thrills and spills in their 5-5 draw with Letchworth. I’m giving it to the Ladies’ 1sts for their hard fought 2-1 home win over Hampstead and Westminster edging out the Men’s 4ths who had an excellent 2-1 home win over league leaders UEA 2nds. The Ladies’ 1sts got off to a splendid start scoring quick goals by Maria Andrews (her 12th of the season) and Lizzie Clymer and they continued to play some sparkling hockey and thoroughly deserved their two-goal half time lead. After the break Hampstead and Westminster looked far more dangerous and they reduced the arrears following a poor clearance by the home defence. Thereafter Magpies, for whom Rose Winter was making a well-deserved debut, had to battle hard to retain their lead which they did despite a ‘goal’ for the visitors being ruled out by the umpires (to the delight of the home supporters) after some initial confusion. This coming Saturday Magpies are at home to Chelmsford (2.00). The Men’s 4ths gave their best performance of the season in terms of consistency over the seventy minutes in beating a skilful and quick UEA 2nds 2-1. They took the lead in the second half when veteran Stuart Peters moved forward to send a crisp shot into the bottom right hand corner. The students equalised with five minutes remaining after some good saves by goalkeeper Murray Graham had kept them out but Magpies were not to be denied and Alex Kilbourn coolly put away a penalty stroke awarded after a well-worked penalty corner. MOTM was Kieran, Mr Peters junior. Meanwhile the Ladies’ 2nds were playing Colchester and they dominated the first twenty minutes but only had Alice Woollatt’s goal (created by sister Katie) to show for their efforts. Colchester had an outstanding player in their team and it was no surprise that she scored their equaliser. Magpies continued to look for a deserved winner but they failed to recapture their earlier form in an ultimately disappointing 1-1 draw. The Ladies’ 6ths got the cold Saturday off to a good start with a 3-0 win over Pelicans 3rds. MOTM Beth Moodie put them ahead before captain Gillian Stokes scored for the third week running to her delight and that of the team’s supporters! In a good team performance Lydia Barrett made the game safe with the third goal. AUCTION OF PROMISES Saturday 4 March 2017 – Clubhouse 7.00pm with auction to commence at 7.30pm. £5 entry to include glass of wine on arrival (or soft drink), nibbles and entry to raffle. Please click here for the first 59 Lots now in catalogue order. The Men’s 1sts were 4-2 ahead at half time against Letchworth with two penalty stroke conversions by Ben Wright (taking his total of goals for the season to 25) and goals by Archie Winter and captain Leigh Sitch. Defender Leigh waved to his fans in celebration! A lively Letchworth team hit back after the break when first the home defence failed to clear after a good save by goalkeeper John Livings (who was in top form) to be followed by a shot from the left which was deflected in off a home stick. With five minutes to go Archie looked to have won the game for Magpies with his second goal only for Letchworth to win and convert a penalty stroke. This Saturday Magpies are away to Dereham (1.30). In the other home game the Men’s 6ths lost 4-0 to North Norfolk 2nds and they were indebted to good displays by defender Peter Finnie (rolling back the years) and goalkeeper Steve Halliley. The team was pleased to welcome new member Ed Overbury. Away from home there were wins for the Men’s 2nds, Ladies’ 3rds and Ladies’ 4ths with, arguably, the most vital being achieved by the Men’s 2nds who beat fellow strugglers Cambridge City 3rds as both teams fight to avoid relegation. Their goals were scored by Matt Bensly, Tristan Baynes and Robbie Kinsella. Robbie’s clincher was a cracker. He collected a clearance from the goalkeeper before advancing into the circle. He then beat the keeper in the one-on-one before despatching the ball high into the net. I fear we are going to hear a lot from Robbie about this effort! On Saturday the team are at home to Long Sutton (3.30) in another vital clash. The Ladies’ 3rds beat Ipswich 3rds 3-0. Amy de Selincourt put them ahead in the first half before Georgie Cantrell scored her 34th goal of the season (spread across three teams) with Sophie Meynell-Anderson (who stepped up into the team on the Friday) getting the third. The joint MOTMs were Amelia Herschel-Shorland and Phoebe Eglington. The Ladies’ 4ths beat Norwich Dragons 4ths 4-2. Imi Meynell-Anderson scored the first with an assist by Amy Collison before Harriett Celerier deflected in after good work by Emily Evans and Rachel Goodson. Grace Collison (making her debut for the team) made it 3-0 at half time. In the second half Imi finished off a fine team move before Dragons hit back with two goals. Molly Warnes was MOTM. The Men’s 5ths lost 2-1 to Norwich Exiles but they had enough chances to be two or three goals ahead at half time instead of one down. Jude Pottruff equalised in the second half before against the run of play Exiles got a lucky break leading to their winner. James Harvey again had a good game in goal for Magpies. Meanwhile the Ladies’ 7ths went down 1-0 to Norwich City 7ths after having most of the play in the first half. City used their superiority in numbers to clinch victory after the break. The Men’s 3rds are now three games behind schedule as their away game against Ipswich 2nds fell victim to snow but their position at the top of the league was strengthened by second placed Newmarket drawing with bottom placed Sudbury 2nds. This Saturday captain Matt Brand and his team are at home to mid-table IES 3rds (1.45). 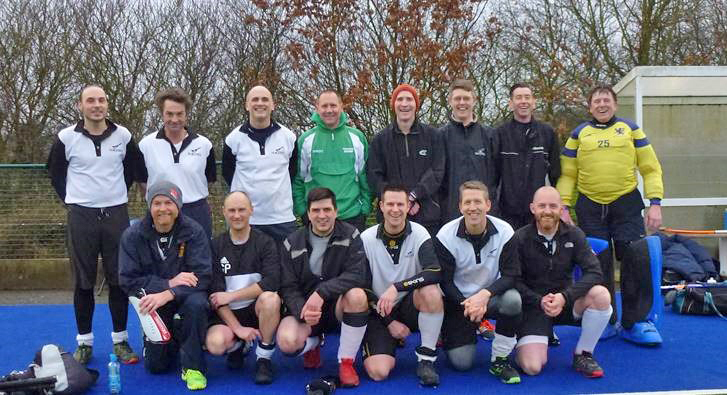 Last Sunday the Men’s O40s clinched a place in the semi-finals of the EH Cup (they play Canterbury away on Sunday 5 March) by beating Cambridge City 4-2 away on strokes after a 2-2 draw. After taking an early two-goal lead through Matt Brand and Gavin Cole Magpies had to withstand a strong response by their hosts who scored their second and deserved goal with four minutes to go. But in the penalty stroke decider Matt, Gavin, David Francis and captain Tristan Baynes, with the clincher, were cool personified and with goalkeeper Murray Graham making a vital save Magpies edged through to the delight of their small band of very cold supporters. There is a lot of hockey to look forward to this weekend and the weather forecast is encouraging as the club catches up with fixtures lost to the frost in January. In addition the club has five matches on Sunday in England Hockey competitions with three of them at home. At 11.00 the U16 Girls play Pelicans in their Midlands League 1 clash having already clinched their place in the regional finals while at 12.45 the U18 Girls entertain Beeston in the quarter-finals of the EH Cup. So far in the competition the U18 Girls have beaten Old Loughtonians 9-3, Dereham on strokes and Norwich City 15-0. Last but not least we have another quarter-final game with the Men’s O50s hosting Cambridge City in the EH Masters Cup at 2.30. Away from home the U14 Girls play Pelicans (12.30) looking to clinch a place in the regional finals and the Mixed travel to play Bourne Deeping (12.45) in the second round of the EH Trophy. Good luck as always to all our teams this coming weekend. Please see the website for the full list of fixtures. Finally, readers of last week’s Hockey Paper www.thehockeypaper.co.uk will have been interested to read the views of 1st team captain Lucy Belsey regarding the team’s season to-date. Well spoken Lucy!